This kinetic-energy kite flown above the fields of Groningen, in northern Europe today created 10,5kw electricity, which is stored in "ladder-mills" designed by Dutch astronaut-scientist Dr Wubbo Ockels. GRONINGEN, The Netherlands -- Dutch astronaut Dr Wubbo Ockels has successfully demonstrated his new energy concept in a field near the university city of Groningen today. He has flown a high-flying energy kite, creating kinetic energy from huge radio-controlled highflying kites. He has designed 'ladder-mills' to store the kinetic energy and convert it into electricity. Three such ladder-mills provide enough electricity to power the entire city of Groningen. The experiment was carried out along the northern coastline of The Netherlands where there's usually more than enough wind to raise the gigantic kites into.The radio- controlled, high-flying kites can create some 10,5kw electricity each, Dr Ockels told a local radio station. "At the moment we are the only developers who have managed to succeeed in this concept, although other groups are also testing it in Italy and Australia," he said. 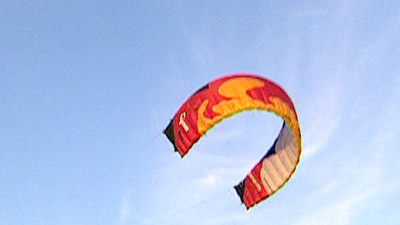 The kites can fly like aeroplanes, so you don't need energy to get it back down again. I want people to stop burning coal and gas for energy and start using these ladder-mills as alternative energy sources," he said.